In need of a new Hatchback? The Nissan Juke is a popular choice but how does it compare to similar models from Suzuki & Kia? The new Nissan Juke Hatchback looks as bold, confident and offbeat as ever. Always the individual, it remains the large Hatchback that stands out from the crowd more than most. Its distinctive looks go hand-in-hand with a high driving position, which is excellent for visibility. However, it’s these distinctive looks that have polarised buyers in the past. If you quite enjoyed its daringness to be a bit different, it’s once again a solid Hatchback that’s worth having on your shortlist. OSV takes a closer look at what it’s all about with our 2017 Nissan Juke Hatchback review. The Juke’s biggest strengths on the road are its responsive steering and punchy engines. Its suspension isn’t too bad either. But while it’s comfortable enough on smoother surfaces, large potholes will send a few vibrations careering through the cabin. Handling is decent, body roll is well managed, but the steering doesn’t involve you enough. As such, while it’s easy enough to drive, we wouldn’t say it’s enjoyable. It’s just a good-looking car that gets you from A to B with few hassles. Moreover, the Juke is lacking in front-end grip. In terms of the engines, a turbocharged 1.5-litre dCi unit makes up the diesel range. It offers reasonable performance, and can do 0-62 in just over 11.0 seconds. Thanks to the presence of turbochargers, it can offer a decent amount of acceleration. However, diesel clatter is problematic and might be a deal-breaker for some buyers. The only way to really drown it out is by turning up the radio. There is a bit more to choose from if you’re a petrol fan, starting with a 1.6-litre unit that delivers a modest 93bhp. This engine powers the entry-level model, and can do 0-62 in 11.5 seconds. If you fancy 20bhp extra, you just need to pair it up with the automatic CVT transmission. However, it never feels that fast, while its ‘box does a good job of choking the engine – which causes it to make a fair few noises. We prefer the 1.2-litre DIG-T turbo petrol. It suits the Juke’s character more, offers more power, and doesn’t cost as much to run. However, it’s the 1.6-litre DIG-T turbocharged petrol engine that sits at the top of the range. Stick to front-wheel-drive, and it can do 0-62 in 8.0 seconds before maxing out at 134mph. Add four-wheel-drive for extra grip, and it covers the same sprint in 8.4 seconds. The offbeat Nissan Juke continues to sport its funky cabin. But as freshly different as this is, it can’t compete with rivals when it comes to out-and-out interior quality. The centre console can be customised in the colours you want, while there are stylish flourishes all over the place. Other positives include a raised driving position for excellent visibility, and a good amount of standard kit. Some buyers might not be able to look past the lack of quality, though. There is evidence of harder, scratchier plastics, but that isn’t the biggest problem – the biggest problem is that fit and finish seems flimsy in areas. And this is an issue, as buyers prefer their family cars to be strong, robust and durable. Comfort is not fantastic either. Not only will potholes cause the car to jerk, wind noise easily finds its way inside the cabin. Practicality is hit and miss. Its boot now measure 354-litres, which makes it over a hundred litres bigger than last time. However, that’s still smaller than most rivals. Moreover, four-wheel-drive models continue to get a 251-litre boot. 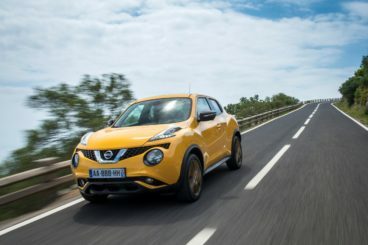 It’s also disappointing that the Juke’s boot misses out on a number of practical touches that would have improved its appeal, such as sliding seats. Still, you can fold the seats in the front-wheel-drive versions to increase its overall capacity to 1,189-litres. Upfront, leg and headroom is good. In the rear, passengers don’t have as much room. A sloping roofline impinges on head space, and even teens will struggle back there. Storage space is average, thanks to a small glovebox and door bins. Standard kit is good, with the entry level model getting rear electric windows and air conditioning. The Acenta model adds full climate control, lashings of chrome on the door handles, as well as a leather gear stick and steering wheel. Bluetooth and cruise control also comes with the Acenta model. The Tekna trim tops the range. 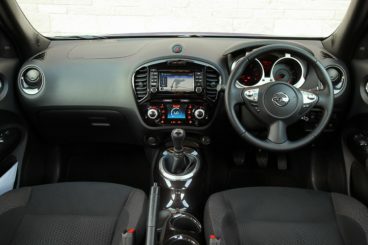 Its standard kit list include a DAB radio, sat-nav, a reversing camera, leather seats and gloss-black finishes. Safety-wise, there should be no concerns. Euro NCAP awarded it 5/5 for its crash-test performance, with the Juke scoring particularly well for adult occupant protection (87%). However, its impressive Safety Shield packs, which comes with moving object detection, blind-spot warning and lane-departure warning is optional on all models except the Tekna. Prices for the new car start out from £14,900 and rise to £23,300. If you prefer to lease, you can pick up a deal from £127 + VAT per month. For more information on our leasing deals, check out our page here. However, the petrols are much more expensive to run, with the 1.6-litre unit returning 47mpg economy at best. The turbocharged 1.2-litre engine fares slightly better, returning 50mpg. 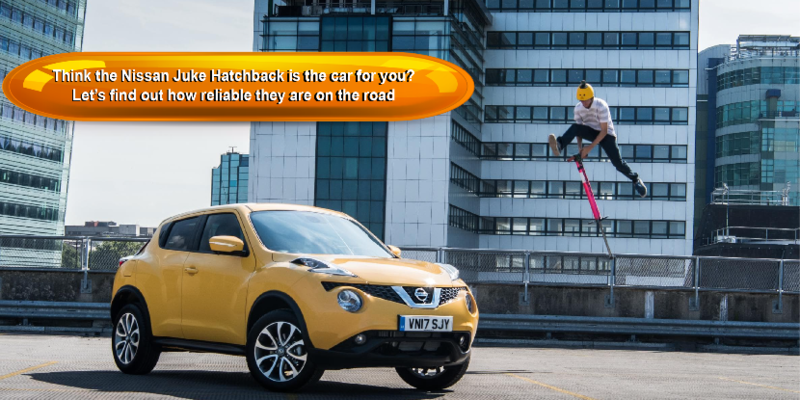 Insurance is more reasonable, with most Juke Hatchback’s sitting in insurance group 12. There is no other Hatchback on the road that looks as fun and unique as the Juke. A decent amount of tech has been added to this second generation version, but prices remain low and start out from under £15,000. Measuring 354-litres, the Nissan Juke’s boot is much bigger than it was before 2014. The diesel is exempt, as it returns 70mpg on a good day. But the petrols are hard to recommend. Despite suiting the Nissan Juke’s character, they return 50mpg at best. Nissan has been a tad guilty of putting form before function at times, especially when it comes to the rear seats. It’s going to be a squeeze for whoever sits in the back. Let’s see how the car measures up against its rivals in the comparison section of our 2017 Nissan Juke Hatchback review. 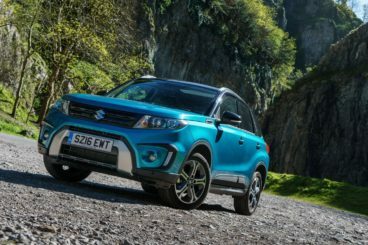 The new Suzuki Vitara is back with a bang. It’s now cheaper to run, comes well equipped, and is entertaining to drive. There might not be much to choose from in terms of the engines, but what’s available is a solid selection of performative and even fun power plants. You get to choose between two gearboxes, too – a 5-speed manual and a 6-speed automatic. We’d go for the super smooth and swift manual any day of the week. The Vitara comes with four-wheel-drive, a system that offers an array of transmission settings that allow you to modify the setup so that it suits your mood and the conditions. You can flick through Auto, Sport, Snow and Lock. In Auto, the car reverts to two-wheel-drive in order to save fuel. It’s an easy car to drive, with light steering a major plus. The engines? A 1.6-litre petrol unit misses out on turbochargers, but with 118bhp it still delivers a satisfying amount of performance. It can climb ascents with ease, and copes well on a full load. Work it hard, though, and it will make a noise. The turbocharged 138bhp 1.4-litre petrol engine offers more power, and does 0-62 in just 10.2 seconds before maxing out at 124mph. But it’s the 1.6-litre diesel that’s a contentious one. It’s cheaper to run than the petrols, and has a respectable zero-to-62mph time of 11.5 seconds. And while you don’t need to work it hard to get the best out of it, it makes more noise than the Juke. It’s also the only engine that’s two-wheel-drive. This weakens its grip, but it means fuel economy is an impressive 70.6mpg at best. However, it’s likely that you’ll average 60mpg. And because the turbocharged 1.4-litre petrol engine returns 52.3mpg and costs the same to tax (£140 a year), it might make more sense than the diesel. Inside, the Suzuki Vitara looks neat and tidy. All models are quieter than the Juke, and its ride quality is good. There are some nice touches too, with the S model getting red stitching on the steering wheel and seats. Build quality is faultless, but there is evidence of cost-cutting here and there. Poorer plastics let the cabin down somewhat, although there is also a good amount of soft-touch plastics, too. Is it practical? A good design job has improved its usability. The light doors make for easy access, opening to 90 degrees. The high seating position makes for good visibility, while the steering wheel adjusts for both rake and reach. Headroom is good for all, with the cars sporty roofline not getting in the way. Back seat legroom is also good, while storage space includes bottle-holders, cup-holders, bins – and a small glove box. The boot, meanwhile, measures 375-litres. Fold the rear seats and you can extend that to 1,160-litres. 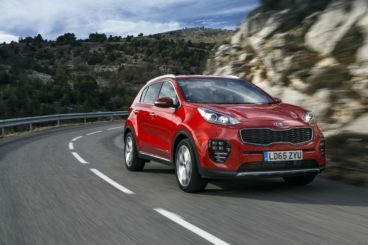 The new Kia Sportage Estate is a handsome large family car that’s roomy, well-equipped, and good fun to drive. One of Kia’s best-looking cars, it’s taller than your average crossover. As such, it’s never going to be an absolute thriller behind the wheel. However, it’s competent enough – and in the right conditions, it’s even entertaining. The steering is direct and positive, and there is lots of grip on offer. Body lean is well-managed, and while the Kia is four-wheel-drive, it spends most of its time in two-wheel-drive. This helps it to save on fuel. In terms of the engines, a 2.0-litre 182bhp is our top pick. It’s flexible, overtakes with confidence, and is nicely refined. You can choose between a 6-speed automatic and a 6-speed manual, but both offer the same performance, with 0-62 knocked out in 9.3 seconds. A 134bhp variant of the same engine is available, and it cuts back the 0-62 time to 10.1 seconds with the manual. The petrol engines won’t be as popular, but we like the look of the turbocharged 1.6-litre unit. It’s quiet, smooth, and quick. Fit it with a 7-speed dual-clutch automatic transmission, and it will do the 0-62mph dash in just 8.8 seconds. Running costs obviously favour the diesels, but they’re not class-leading when it comes to economy. An entry-level 1.7-litre diesel is the most frugal, and it returns 61.4mpg economy. Our top pick, the 182bhp 2.0-litre diesel, returns 54.3mpg, while the petrols struggle to return over 44mpg. Inside, the cabin won’t excite you, but there is a lot of quality in here. The seats are super comfy, there is plenty of standard kit, and the dash is logically arranged. Everything feels great to the touch too, and you get the impression that Kia have paid close attention to detail. Each model gets an easy-to-use touchscreen, as well as a DAB radio, Bluetooth, and a USB port. In terms of how practical it is, the Kia benefits from a bigger boot than last time. It now measures 503-litres if you pick a two-wheel-drive model, and 491 if you pick a four-wheel-drive model. You can extend this to 1,492 and 1,480-litres respectively by folding the rear seats. There is a boot lip, but it’s not so well-pronounced. A parcel shelf beneath the floor and tie-down points enhance its practicality. Other than that, interior space has been improved by extending the wheelbase, and all your passengers should be comfortable enough. You’d have thought that being such a common sight on our roads would have counted against the Juke’s sense of individualism. However, its unique looks continue to stand out. As an overall package, though, there remain question marks. It’s affordable to buy, but not especially frugal. And while the Juke created the supermini crossover niche in the first place, it’s failed to grow at the rate of rivals. A 354-litre boot is its biggest yet, but rivals offer more boot and cabin space. Still, it’s all about what you need. The 2017 Nissan Juke Hatchback looks fab, is stuffed with tech, and continues to have a lot of appeal.